This Thursday night Seattle will be looking to quickly erase the memory of a bad loss on a short week. The Seahawks fell to 5-3 straight-up and 3-5 against the spread on a last minute 17-14 loss to Washington late Sunday afternoon as eight-point home favorites. They head on the road this week with a 2-3 record ATS when closing as favorites. The total stayed UNDER closing 44.5-point line against the Redskins and it has stayed UNDER in three of their last four games. Russell Wilson put the ball up 45 times in Sunday’s loss for 297 yards and two scores a week after throwing for over 400 yards and four scores in a victory at home against Houston. The biggest difference between the two efforts was 41 points in win over the Texans and 14 points in the loss to Washington. This type of inconsistency has plagued this offense all year long even though it is still ranked fourth in the NFL in average yards gained (378.6). Arizona was able to even its record to 4-4 SU with Sunday’s 20-10 road win against winless San Francisco as a 2.5-point road favorite. It was just the second time this season that the Cardinals covered the spread and the total has now stayed UNDER in six of their last seven games. 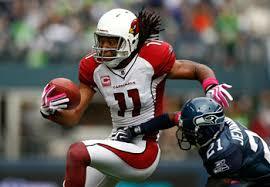 They return home with 1-2 record ATS in three previous games this season at U of Phoenix Stadium. Drew Stanton got the start at quarterback in Sunday’s game with Carson Palmer on the shelf for the rest of the season with a broken arm. He completed 50 percent of his 30 throws for 201 yards and two touchdowns. Larry Fitzgerald came down with five catches for 70 yards, but the biggest star of the game was Adrian Peterson running the ball with 159 yards rushing on 37 carries. This was a major improvement from an offense that was one of the worst running teams in the league.